This year’s final four is getting alot of attention because of VCU and Butler’s inclusion, but the other side of the bracket should get attention too…for all the wrong reasons. Kentucky and UConn have something in common besides using a shade of blue, both of their coaches are cheaters. 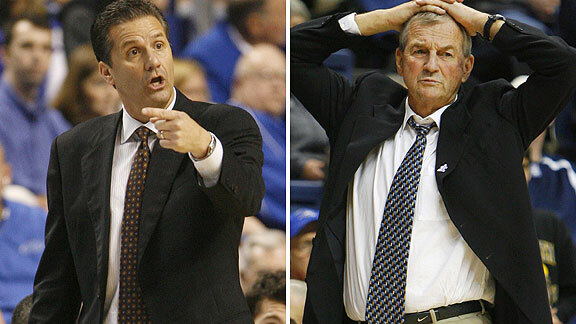 John Calipari and Jim Calhoun are everything that is wrong with College Basketball, and college sports in general. The National Championship game sets up perfectly, it will be one of these two cheaters facing off against an unlikely Cinderella story. Maybe one day the NCAA will cleanup programs run by guys like Calhoun and Calipari, but for now we must knockout teams that get it done the right way, and wait for the violations to come later. Calipari has never made a final four and not had it taken away, while Calhoun is a sleazeball who finally got caught this past year, but didn’t pay nearly enough for it. Even if VCU or Butler lose in the National Championship, they could still win it all. Think about that. I ask one question, what is the over/under on how long it takes for the NCAA to take away this final four from Calipari? This entry was posted on March 28, 2011 at 12:44 pm and is filed under College Basketball. You can follow any responses to this entry through the RSS 2.0 feed. You can leave a response, or trackback from your own site. I believe EVERY program cuts corners. Calipari has done his entire life. Calhoun has been caught recently. And I’m pretty sure VCU and Butler don’t play by the rules at all times. For example, when Jamie Skeen was at Wake he was kicked out for academic violations (cheating). You think he’s not doing that at VCU? Pretty sure the guy didn’t gain any morals going to a mid-major squad. Cheating is part of NCAA basketball. Nonetheless, I would love to see VCU or Butler win it all this year. Personally, I’m not the biggest fan of either Calipari or Calhoun. Hi there, the image at the top of this web site submit is packing a little unusual for me? I attempted delivering an e-mail but it really bounced again.